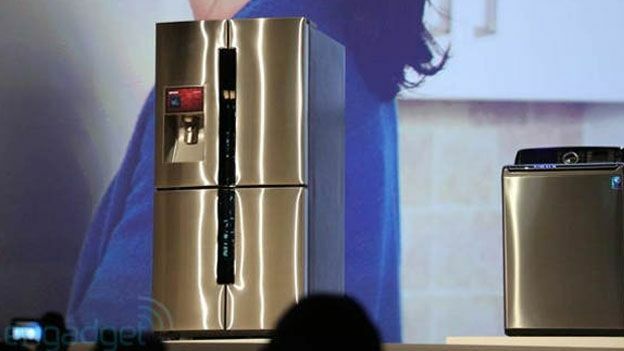 Samsung launches the T9000 LCD - the fridge with a split personality that lets you turn fridge compartments into freezer compartments whenever mum's been to Iceland. Samsung has unveiled its latest innovation in kitchen tech - the Samsung T9000 LCD - a 32 cubic-feet capacity four-foor refrigerator featuring one compartment that can be switched from fridge to freezer mode whenever the need arises. The sleek food chiller features a 19.4 cubic feet capacity french-door refrigerator compartment on top, and a 6.1 cubic feet compartment on the lower right side, providing an extraordinary 25.5 cu. ft. of fresh food storage. The T9000 also features Samsung's Triple Cooling system that claims to deliver commercial-grade humidity levels to keep food fresher longer. A built in LCD touchscreen can run apps such Samsung's proprietary Evernote app, which allows you to share photos, videos, and recipes with family and friends. The T9000 LCD also includes calendar and weather apps.